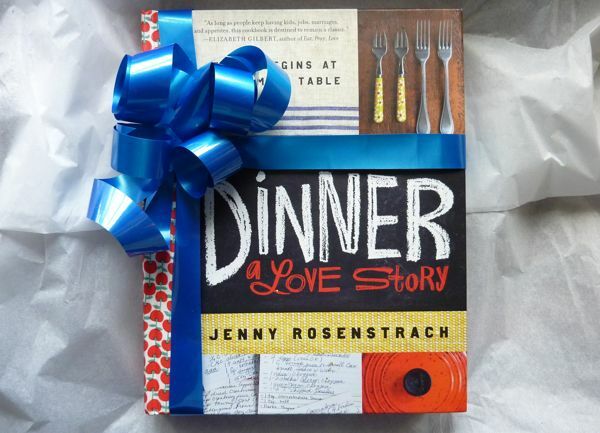 I’m still completely thrilled when I hear that my book has been purchased by someone who I can’t in any way trace back to my mother or mother-in-law, but I think the highlight of my year was hearing that Dinner: A Love Story was on the registry of someone whose wedding I’m not even invited to. It’s true that my book is based on this blog which is based on meals with our 10- and 8-year old, but the book starts with the “Love Story” part, the year Andy and I got married, when kids were about as far from our minds as the pork ragu that would someday make my husband famous. (Well, famous with his mother and mother-in-law at least.) I’m pleased to announce that Real Simple seems to agree about the gift thing — because it’s in their June issue, right there in the Summer Gift Guide (for Newlyweds, Weekend House Hosts, Father’s Day), and last time I checked, no one in my family was on their payroll. As soon as the link is live I will send you there — for now you’ll have to go to a good old-fashioned newsstand. Remember those? Congratulations, Jenny! I am looking so forward to June 5. I often give my kids a little gift for their last day of school, which is also June 5. This year I am going to give myself a gift, too. I can’t wait to buy Dinner a Love Story! that is awesome. Congratulations Jenny! I love hearing news like this, I am so happy for you!!! A well deserved honor indeed! I got mine pre-ordered for Mother’s Day and I’m counting the days until it gets here! Can’t wait! You know, I hadn’t thought of DALS as a WEDDING PRESENT. How perfect! Also, I think I’ll be making the Peanut Butter Noodles from page 261-2 tonight. I put mine (soon to be book) on my baby registry, and I look forward to reading it! Congratulations Jenny! Your blog is the one I recommend most. It’s on my wedding registry! Although I’m not sure I can wait that long to read it. Maybe we’ll end up with His and Hers copies.